Zimbabwe’s President Robert Mugabe resigned on Tuesday, succumbing to a week of overwhelming pressure from the military that put him under house arrest, lawmakers from the ruling party and opposition who started impeachment proceedings and a population that surged into the streets to say 37 years in power was enough. 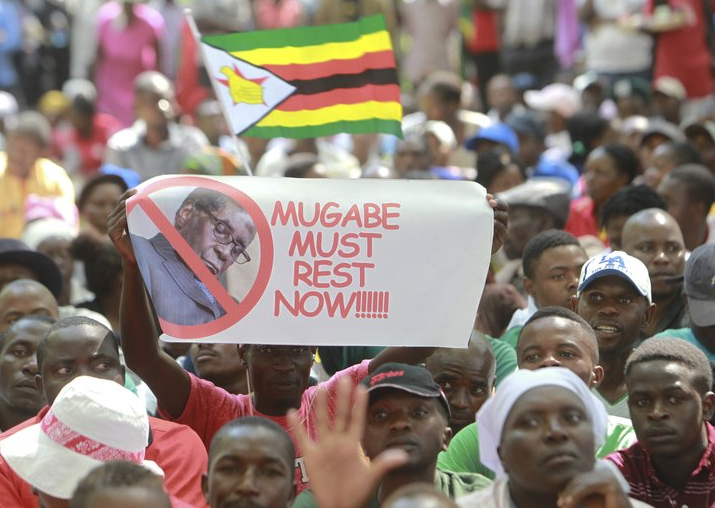 The capital, Harare, erupted in jubilation after news spread that the 93-year-old leader’s resignation letter was read out by the speaker of parliament, whose members had gathered to impeach Mugabe after he ignored escalating calls to quit since a military takeover. Cars honked and people danced and sang across the city in a spectacle of free expression that would have been impossible during his rule. “Welcome to the new Zimbabwe,” people chanted outside a conference center where the lawmakers met. Recently fired Vice President Emmerson Mnangagwa would take over as the country’s leader within 48 hours, said a ruling party official, Lovemore Matuke. Mnangagwa, who fled the country after his firing on Nov. 6, “is not far from here,” Matuke said. Mugabe can participate in a formal handover of power “so that Mnangagwa moves with speed to work for the country,” Matuke said. Mugabe’s resignation brought an end to impeachment proceedings brought by the ruling ZANU-PF party after its Central Committee voted to oust the president as party leader and replace him with Mnangagwa, a former ally of Mugabe who served for decades as his enforcer with a reputation for being astute and ruthless, more feared than popular. Before the resignation, crowds rallied outside the parliament building, dancing and singing. Some people placed photos of Mugabe in the street so that cars would run over them. Opposition leader Morgan Tsvangirai of the MDC party said the culture of the ruling party “must end” and everyone must put their heads together and work toward free and fair elections. His party had seconded the impeachment motion. “Never should the nation be held at ransom by one person ever again, whose desire is to die in office at whatever cost to the nation,” said Mnangagwa, who has a loyal support base in the military. On Tuesday, Zimbabweans simply enjoyed the moment.